If you grew up in the late 60’s or 70’s, that warm smiling face on your television set, who offered this daily greeting after he changed into his trusty cardigan and sneakers, has recently cropped up in lessons to share today. Mister Roger’s Neighborhood debut was over 50 years ago and ran for 33 years on public television. It is a legacy that continues to grow and resonate with people of all ages. Think of 1968, and consider the strange similarities to the times now…political and racial tensions were at an all-time high. Riots and protests were happening all across America. Family and friends were at odds over everything from the Vietnam War to music choices. Then, as now, Mr. Rogers came into our homes, modeled the best in all of us and reminded everyone of the good and positive in life. The guiding principle of his daily lessons was simply, always be kind…”a good neighbor”. “In times of stress, the best thing we can do for each other is to listen with our ears and our hearts and to be assured that our questions are just as important as our answers”. “Love and trust, in the space between what’s said and what’s heard in life, can make all the difference in the world”. Mr. Rogers helped children find the desire within themselves to be better. As adults in the healthcare industry, we can as well. For example, if a doctor warns someone with a heart problem to stop smoking and exercise more to increase his odds of living longer, the patient may feel offended and often won’t take the advice. But if the doctor says, “if you stop smoking and exercise more, you’ll be able to play with your grandchildren longer without becoming short of breath and needing to rest,” the patient will be more likely to want to change his unhealthily behavior. The doctor simply phrasing the request like this appeals to the patient’s love of his grandchildren and comes off less judgmental and more supportive. Whenever it comes to a sticky or polarizing issue, if you challenge someone aggressively, that person is going to feel even more strongly about his own opinion, even if it is wrong, because emotions override facts. Get to a better place together by discussing differences of opinion in a respectful way. The U.S. 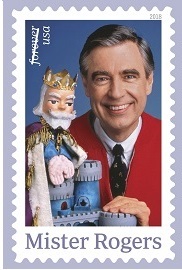 Postal Service plans a March release of this postage stamp featuring Fred Rogers and his King Friday XIII puppet from the PBS children’s television series Mister Rogers’ Neighborhood. What is said and what’s is heard ummmm? That is a deep sentence. A example was used about someone that has an addiction. A lot of poor health choices are based on child hood experience that followed in to adulthood. Sometimes words can make a difference. Otherwise a physical life experience will wake a person up normally. I grow up with deep southern cooking yum. Know one told me food was medicine for your body. Eating bad food choice all the time can effect your health. Yes by being kind with your actions and your words, the best you, is the best example you can share with humanity. I totally agree with this great article of being a helping hand to your neighbor.